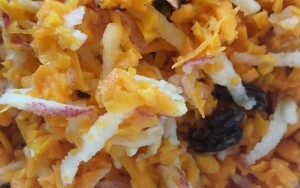 Peel the squash and shred it in a food processor with the shredder attachment. If you don’t have a shredder attachment you can dice it fine in a processor or shred it by hand. Shred the apples and combine them in a bowl with the squash. Add raisins, apple cider vinegar, salt and pepper to taste. The combination of sweet from the apples and raisins works well with the tart of the vinegar. Add enough of these ingredients so that the squash is not dry. This is even better if you let it sit for a few hours or overnight. From Alissa Cohen – Newsletter.